A habitat is generally understood to mean simply the place where an organism lives. It may also refer to the place occupied by an entire community of organisms. 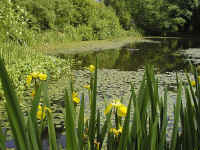 Woodland, ponds, hedges and rotting wood are all habitats. The habitat of an organism or group of organisms (population) includes other organisms as well as the surrounding physical environment. Landscapes are made up of an interweaving of habitats, often with no clearly defined boundaries. Landscapes have been shaped over aeons by weather, geological movements and latterly by humans. Humans have been an integral part of the landscape for thousands of years and have been shaping and altering their surroundings ever since the discovery of agriculture in Neolithic times in Britain. In order to retain a diversity of habitats and species, it is vital that we continue to have an input through habitat management and restoration. Over the last hundred years there has been an unprecedented change in the UK countryside and this has resulted in the destruction of British habitats. It is important to appreciate that it is the habitats which are the key to having a diversity of species in the country. You cannot have wildlife without the habitats. These changes have been brought about by modern agriculture, forestry, the extensive urbanization of the countryside and the expansion of every town and city. In the last 50 years, 75% of ponds have been lost. In Leicester, some parishes have even lost 90% of their ponds. In very urban areas, 100% of ponds have been lost. This has meant that once common species, such as the Common Frog, are actually no longer common. In the last 25 years, 10% of British dragonflies have become extinct in Britain. English Nature, the Government organization responsible for nature conservation, has said " No other group of animals has suffered such a loss of species". Again, habitat loss has meant that two thirds of Britain's woodland butterflies are under threat. Since World War 2, three quarters of Britain's butterflies have decreased in number. The Large Blue became extinct in 1979, although attempts are being made to introduce populations of the Large Blue which remain in Sweden. Although this is the same species, it will not be genetically identical to the original native Large Blue. It is therefore not strictly true to say that the species is being restored in Britain. (This is akin to exterminating everyone in Wales and then saying, "Never mind, we will just repopulate it with French people.") Other butterflies which have become extinct include the Large Tortoiseshell, which is the fifth butterfly to become extinct in Britain in the last 150 years. 25% of bird species are also declining. Mammals which have decreased include Pipistrelle Bats, which have decreased by 66% in the last 11 years. The Noctule was once one of the most widespread bats and was conspicuous until the 1950's. It is now said to be virtually extinct. Habitats which have been destroyed since World War 2 include 97% of our wild flower meadows, over 200,000 miles of hedgerows which equates to approximately 8 times around the world! Half of our ancient woodlands have disappeared, as well as 75% of heaths. Gardeners have been responsible for the destruction of 98% of our lowland raised bogs, because of the removal of peat for use in their gardens. This means that most of the plants and animals which lived there can no longer exist because the specific conditions they require are no longer present. Over the last 100 years there has been a complete transformation in the number of wild flowers. 22 species of wildflower, including the once common Corn Cockle are extinct. A further 317 are on the brink of extinction. Habitat loss has resulted in the disappearance of 150 species from Britain over the last 100 years. Professor Bellamy has said that "about half a dozen were only found in the UK and have been lost to the world forever." This loss of species results in a decrease in genetic diversity which impoverishes the whole world. Such losses can only be sustained up to a certain point, beyond which ecosystems will begin to break down. Sir David Attenborough highlighted our dependence upon the natural world when he said "The interdependence of species evolved over millions of years and underpins the complex diversity which exists on this planet". Ultimately human beings cannot exist without the planet's life support systems and for this reason, habitat loss affects us all. For an article introducing habitats click here. Access comprehensive reports on woodland restoration. This site has the most comprehensive information on lowland heathland to be found anywhere on the internet. Details of a wetland restoration project and survey can be found here. Access a guide to ecological sampling techniques here. To access hundreds of pages about wildlife click here. For information about biodiversity click here. To access species lists click here. For Freshwater_analysis at the Woodland Education Centre click here.